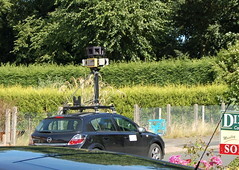 While I’m sitting working, what should I see out of the corner of my eye than the Google Street View Car. Breathlessly excited, I rushed to get my camera — luckily I’m in a cul-de-sac so I knew it was coming back. I stood on the doorstep and without time to focus or zoom snapped a few shots as it went back past. It flashed when it was about level with me, so I guess I’ve been mapped.